Unbridled Rocket, ridden by jockey Martin Pedroza and trained by Jack Carava, wins his second career race and provides the partnership of Greg Burns or It Pays to Dream Racing Stable, Inc. (IPTD) its first victory on April 30, 2017. Greg Burns' or It Pays to Dream Racing Stable, Inc.'s Paschalitsa (blue silks), ridden by jockey Flavien Prat and trained by Jack Carava, nears the finish line at Santa Anita en route to winning her racing debut for her owners on June 16, 2017, and providing them with their second consecutive victory. 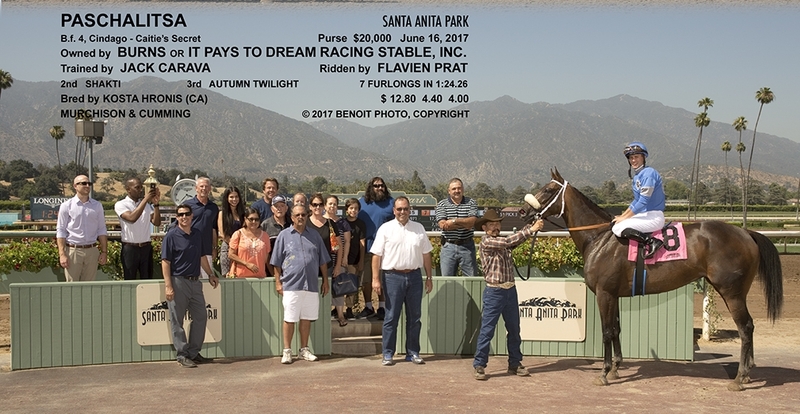 It Pays to Dream Racing Stable, Inc. (IPTD) President Greg Renick (front row, center left) and Secretary Dolores Renick and majority owner Greg Burns (front row left) elebrate Paschalita's victory on June 16, 2017, with co-owner Greg Burns (front row, left), trainter Jack Carava (front row, center right), Jockey Flavien Prat, as well as family and friends. 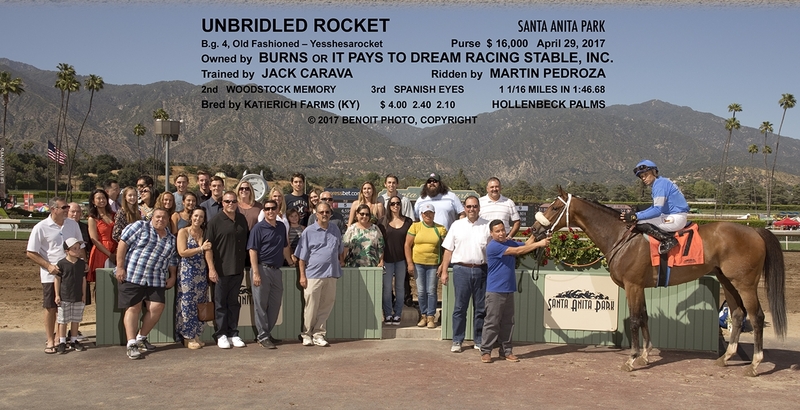 It Pays to Dream Racing Stable, Inc. (IPTD) President Greg Renick (front row, center left), IPTD Secretary Dolores Renick (second row, center left) and majority owner Greg Burns (second left, front row) celebrate Paschalita's victory on June 16, 2017, with co-owner Greg Burns (front row, left), trainter Jack Carava (front row, center right), Jockey Flavien Prat, as well as family and friends.